Look at this glorious, glorious glory. Oh, glory glory hallelujah. We are stacked. If it was 2006 D-Wright and not dead as a doornail D-Wright, we might have the best O in the league as well as the best staff. I would’ve preferred Tejada over Soup. Flores as the backup SS is bad. Can Cabrera play every day? We pray. 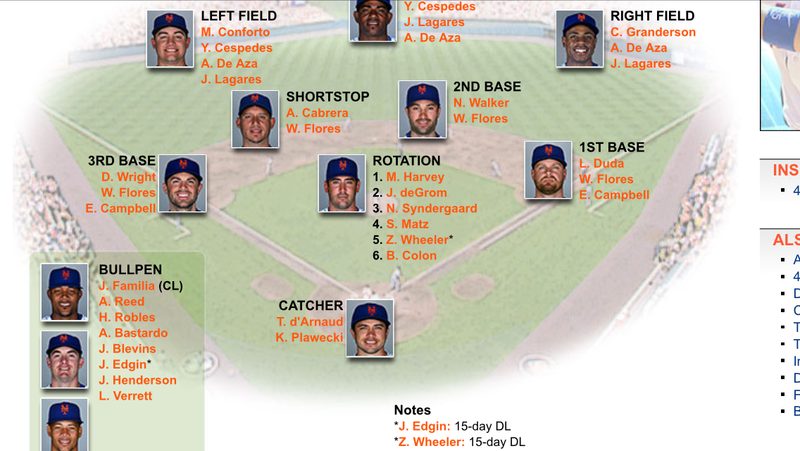 Once Wright gets injured (Today, probably…May, the latest, unfortunately), Flores will play 3rd. On days where someone else (like Duda) needs a day off, Wilmer “Zobrist” Flores will go to that position and we’ll have to see Soup. Fuuuuuuck Soup. And I like Flores but he’s an oak tree at short and not much better anywhere else. Pray for D-Wright. I’ve never felt this way going into Opening Day. Thanks to Metsblow Nation, we actually don’t currently blow for the first time ever. Even in 2000, I thought, “we’re not as good as the Braves.” Even in 2007, I thought, “our pitchers are old.” 2016 is completely uncharted waters for us, as far as I’m concerned. In years like 2000 and 2006, I thought we were one of 8~10 competitive teams, and it felt good. The reality of today is that we are one of 4 teams with a legitimate shot. Things change. Injuries and bad chemistries and deadline deals…who knows? But one thing is for certain: 2016 marks the best opening day roster of my lifetime. Let’s see how we screw it up.